During the fag end of 1800 and beginning of 1900, Tamil estate workers including women used to trek to Agasthyakoo-dam and worship. Trek enthusiasts say John Allan Broun who was the director of Trivandrum Observatory in 1852 went to Agasthyakoodam within two years of taking charge. Thiruvananthapuram: Defence PRO Dhanya Sanal is not the first woman to trek Agasthyakoodam hill as there have been several instances in the past of women climbing the second highest peak in state. Dr Madhumita Panigrahi, who was a researcher with Coimbatore-based Salim Ali School for Ornithology and Natural History said she had trekked the Agastya hills six to seven times during 2012-14 for her research project. She had never thought Agastya outings would be part of her project. Her research took her there and she is happy about it. “Nobody ever objected to my research sorties. Others who visited the hill were very accommodative and respectful towards me”, Ms Panigrahi said. She recalled that she was not only woman to undertake the trek. There were other women also. “Hence, this row over women entry at Agasthyamalai is farfetc-hed”, said Ms Panighrahi, who is now a scientist with Bombay Natural History Society. Trek enthusiasts say John Allan Broun who was the director of Trivandrum Observatory in 1852 went to Agasthyakoodam within two years of taking charge. He trekked Agasthyakoo-dam along with his wife, two kids and workers. 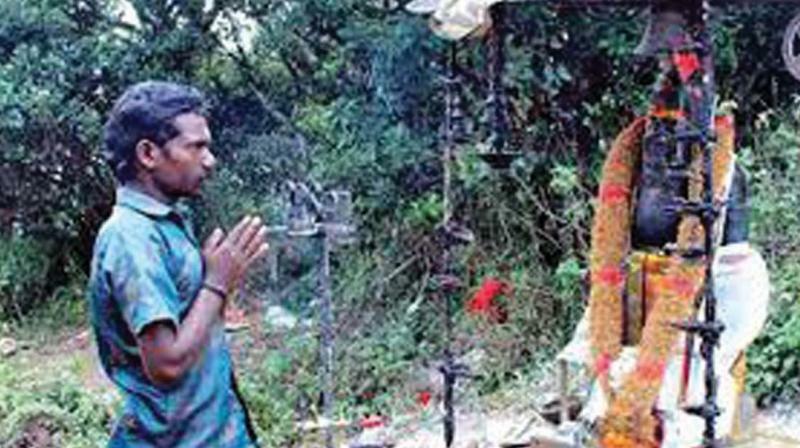 During the fag end of 1800 and beginning of 1900, Tamil estate workers including women used to trek to Agasthyakoodam and worship. They had lit a lamp. In 1970 hundreds of workers dealing with cotton and synthetic thread took one and a half days to install the statue. This practice continued till the idol was stolen in 1984.